I had jury duty yesterday. This was only a significant event because of the mere fact I freaked out about it. I’m not sure why I made such a big deal of it, it just made me pretty anxious. It all turned out fine; I was dismissed. How does this relate to food you ask? Well, here’s the thing: once I was dismissed, I surfaced from my anxiousness and disillusioned civic-mindedness, and realized it was a weekday during the day. And I was downtown. Right by the library. I went in, and immediately inquired about the whereabouts of the cookbook section. An elevator ride and a few laps around the “book spiral” later, I was surrounded by culinary masterpieces aplenty. Where to start? I quickly grabbed Spice by Ana Sortun. I’ve been dying to cook one of these recipes since I went to her bakery Sofra in Boston a month or so back with my dear friend Rachel. Sortun is best known for her restaurant Orleana, which I have not had the fortune to eat at. Yet. Someday I will. Rachel tells me it’s divine, and based on the deliciousness of Sofra, I’m fully convinced it’s be a magical eating experience. At Sofra, I was dying to try the Shakshuka (eggs poached in tomato with curry and pita crumb) but the crowd was too intense for sit down food, so we got pastries and coffee and ate in the winter wind on the patio. It was very French, we thought. We hadn’t had our fill though, so we went back in and bought some treats for lunch. 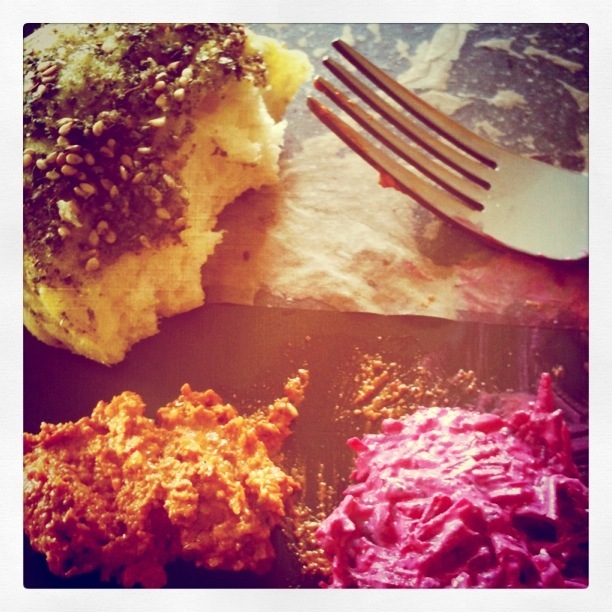 We selected some savory bread seasoned with za’atar as well as beet tzatziki and muhammara. I also snagged some cocoa spiced hazelnuts as a souvenir. Those were totally worth the $12 price tag. Honestly. With Spice in hand last night, I set to work making beet tzatziki and prosciutto with fennel and blood oranges. The light, fresh flavor of the fennel and blood orange complimented the prosciutto perfectly. I used golden beets for my tzatziki, but they were still quite tasty. It was easy to prep, and all in all a perfect meal to enjoy with a glass of white wine (since it’s almost spring) and relax away the stresses of the week. P.S. – Best excuse for why jury duty would be a “hardship:” Um, I have plans to travel to London, England for the Royal Wedding.